"We had two contenders, Vincenzo and myself, so we tried everything, but Chaves showed that he was the strongest today. I didn't see what happened to Poels because I was just bit further back, but I am sorry for him." "Even I am surprised: I didn't think I would be going so well." 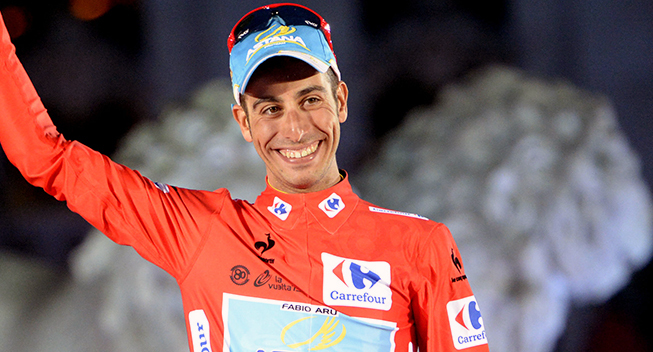 Those were the words of Astana's Fabio Aru after stage three of the Abu Dhabi Tour. Aru finished in second place behind the winner Johan Esteban Chaves of Colombia in the queen stage which featured the only mountain-top finish of the race. Aru with Alexey Lutsenko, Vincenzo Nibali and Paolo Tiralongo took control of operatons at the beginning of the 11km climb making a big selection in the bunch . Nibali was the first to attack with 5.5 km to go followed by his teammate Fabio Aru, thus making a really good team game. Aru on the eve of the final stage is now second in the General Classification with a lead of 16 seconds from the raceleader Chaves. "We had two contenders, Vincenzo and myself, so we tried everything, but Chaves showed that he was the strongest today," he added. "I didn't see what happened to Poels because I was just bit further back, but I am sorry for him. "The season has finished well for us. I have have tried to honour every race that I have started, even when I have not been at my very best. I had a lot of commitments in September, and I was not in a position to train in the best way, but I have tried to do my job and give everything I had."